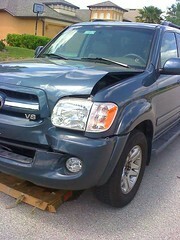 The week started off with a fender bender that Jennifer got into. Well, it was a fender bender for the other SUV. For ours, it was more of a smash the radiator and push in the hood. We contacted our insurance and the truck is being worked on. The wreck did around $5000 worth of damage and we should have it back in a few weeks. In the meantime, we are renting car. On Saturday, EA paid for the whole company to go to Universal Studio. We could pick either park and then they were going to have a “picnic” lunch in the Universal CityWalk. We chose to go to the Islands of Adventure this time since we had never been there. Last time EA did this we chose the Universal Studios park because we thought the kids were too young for Islands. It turns out there was plenty of things for them to ride. 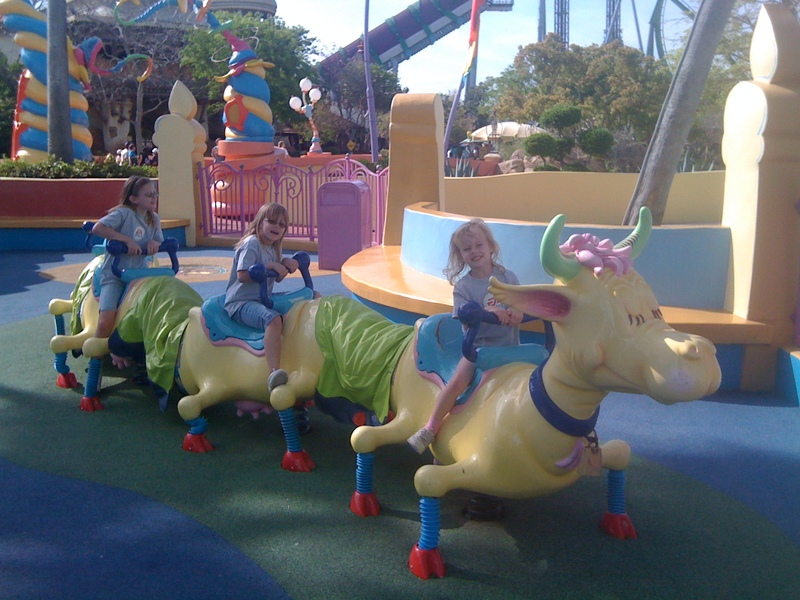 We started off in the Dr. Seuss area of the park, which had a few very tame rides, which the girls liked. We then headed over and saw the area where the new Harry Potter section of the park will be opening up in a couple of months. We split up so that Jennifer and I could take turns riding the Dueling Dragons roller coaster. It’s a couple of coasters which are intertwined where your feet are dangling free. It was pretty intense, several corkscrew 720 spins and a couple of full 360 loops. Both Jennifer and I were dizzy when we got off and it took us like 15 – 30 minutes to recover, but it was still fun. When we got over into the Jurassic Park area, we decided to take the whole family on the River Adventure ride. The first part was pretty tame, just floating around looking at giant animatronic dinosaurs. Once you go into a building and start climbing way up into the air, it gets more intense. The last part of the ride has a giant T-Rex and you are heading right for it and then you drop. Needless to say Emily and Izzy weren’t too thrilled. Perhaps we should have warned them, but then we wouldn’t have gotten such a good picture as we were falling. Overall, it was a great day at the park and we are thankful to once again be working for a company who will occasionally spring for such things. We’re now back home after our week-long trip to Texas for my sister Jill’s wedding. While it’s great visiting with friends and family, it’s always nice to return home and to be sleeping in one’s own bed again. While we were in Houston, we visited the Houston Museum of Natural Science and the Butterfly Center. 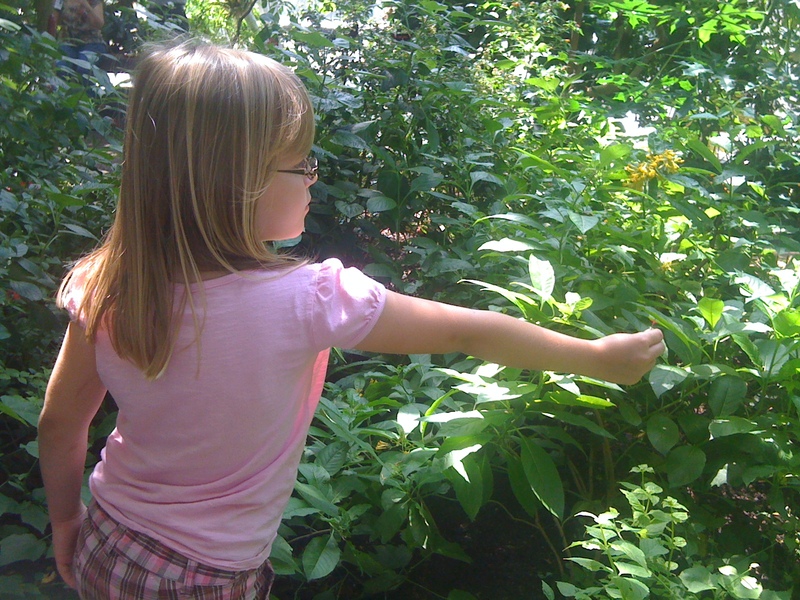 We walked around looking at the various exhibits, but the best part was the Butterfly Center. It was amazing how many butterflies were flying around. One of the workers said there’s approximately 2,000 of them. Emily tried several times to try and get one of them to land on her arm. Even picking a tiny flower at one point, trying to pose as one of the plants that the butterflies were hovering around, but she had no luck. The flight back was pretty uneventful. The plan was for the Jennifer and the girls to wait and get the luggage while I headed out to the long-term parking and pick up the Sequoia. I reached the truck and realized that Jennifer still had the keys. I had to trek all the way back to the terminal and meet up with Jennifer. By the time I got back our luggage had arrived so we all hauled our bags out to the Sequoia. To top it all off, we couldn’t pick up Austin from the kennel because they had already closed. We all had fun in Texas, now it’s back to work and school here in Florida. This weekend we flew out of Orlando to Houston in order attend my sister’s wedding in Shreveport. We decided to fly to Houston and then drive to Shreveport in a rental car because it ended up being cheaper than flying to Shreveport. There were no direct flights to Shreveport and that extra hop would have cost us another $500. So, we collected some of the points on our credit card and then used them to rent a mini-van for the drive. The flight went smoothly and the drive over to Shreveport was pretty easy. 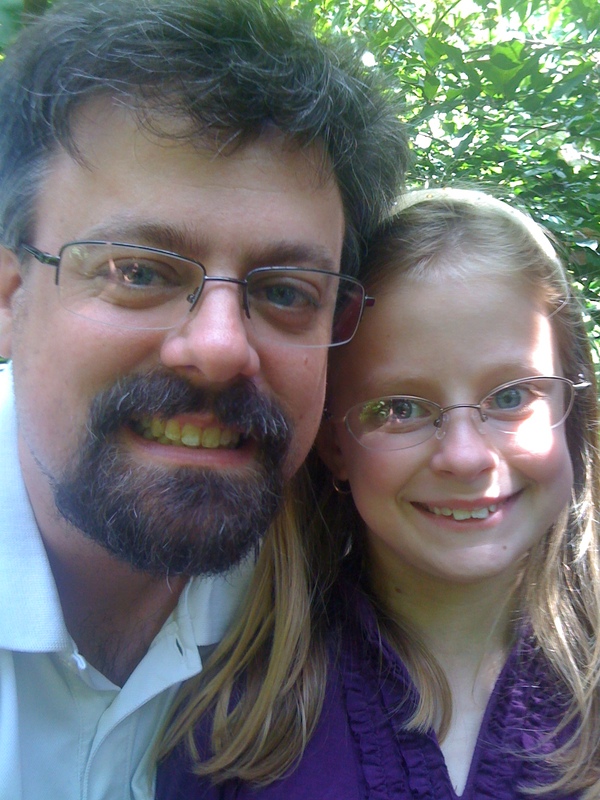 We realized it had been several years since we had actually made that drive and the girls did great. I guess that’s the advantage of them being a little bit older now. Less drama around hour 3 in the car, which is what usually happened in the past. Friday was the rehearsal. I met my fellow groomsmen, friends of Chris’s, for the first time. Abby, Emily, and Isabelle were also going to be in the wedding and they got instruction on what they were supposed to do. Afterwards, we headed over to Ralph & Kacoo’s for the rehearsal dinner. I tried some alligator, which tasted great (also like chicken of course). We had a great time visiting with Nana and Poppy, who sat at our table. The girls kept them in stitches when they told Poppy about their “get the plunger” saying that they made up. The next day went pretty fast. We all got dressed up and headed over to the American Rose Center for the wedding. A lot of people had showed up and soon the wedding was underway. 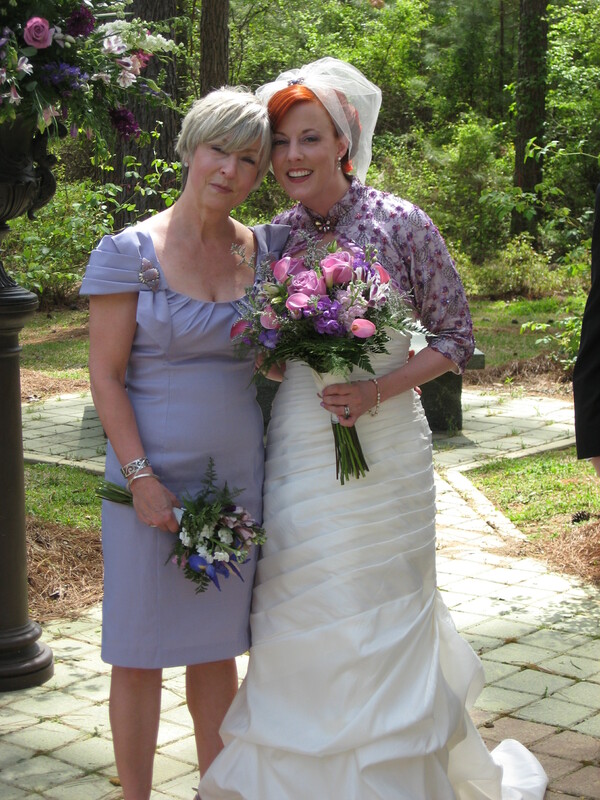 I escorted MaMaw and my mom down the isle and then ran back to be part of the wedding party, escorting my cousin, Brooks-Ann Camper, down the isle. 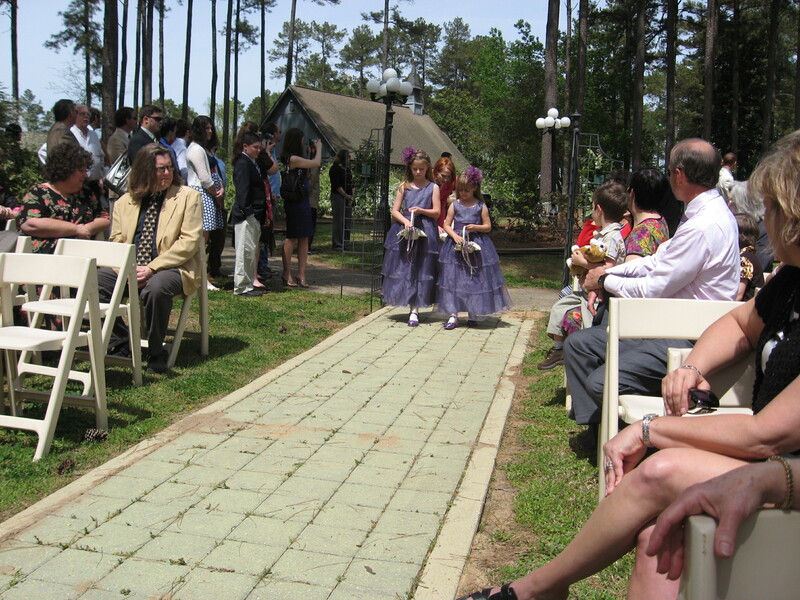 Next Abby and Emily came down the isle throwing purple flowers and next Isabelle came down the isle caring the ring pillow. Finally, Dad came down escorting Jill. 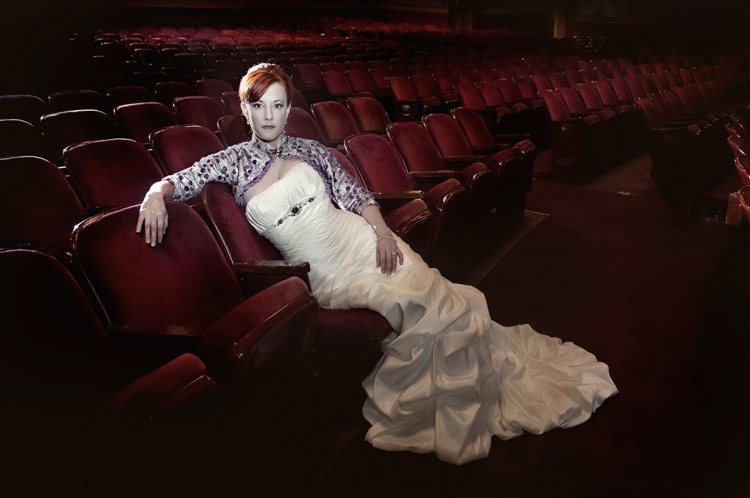 She looked wonderful in her wedding dress and the jacket that Brooks-Ann had made for her. The vows went fast and before you knew it, we had a new member of the French family, Chris Anderson. He instantly became an uncle to our three daughters, which I reminded him of when we all had dinner together on Sunday evening. On Sunday morning, the Easter Bunny came and visited Nana & Poppy’s house. He was pretty sly hiding eggs in the room right next to where the girls were sleeping. But, they got up early and searched for the eggs that were hidden throughout the house. Nana and Poppy also gave them some kites, which we went down to LSUS to fly later that morning.